Police call the shooting of Richard Black Jr., a Vietnam veteran, a heartbreaking outcome for a man defending his family against an intruder. A Colorado police chief on Thursday described a chaotic scene before an officer fatally shot a Vietnam veteran who had killed an intruder assaulting his grandson early Monday, and said the veteran didn't comply with orders to drop his gun, orders he may not have heard clearly due to a hearing impairment. Metz called the shooting of Black, 73, a tragic outcome for a man who was defending his family. "It was heartbreaking," Metz said of his reaction to watching body camera footage of the officers’ response and the deadly shooting. "It is very horrific to watch, not just from the standpoint of watching a man who saved his family get shot, but also knowing what that little boy was subjected to," he said. The Aurora police chief said that when officers encountered Black, holding a flashlight in one hand and a gun in the other, they ordered him five times to drop the gun, Black did not drop the gun, and after he raised the flashlight towards police, one officer fired four rounds, striking him. Investigators learned from Black's family that he had a significant hearing impairment from his military service, and it's unclear what he heard. Metz also said that from the body camera video it does not appear officers used the word "police" but they were in full uniform. Metz said that a party or other gathering was taking place across the street from the Black home, that a man there for unknown reasons began damaging vehicles outside and injured himself in the process, and that he then went over to the Black home at around 1:30 a.m. and pounded on the door so violently that it knocked the door off its hinges. That man, identified as Dajon Harper, 26, then entered the Black home, grabbed an 11-year-old boy and took him into a bathroom and locked the door, and the boy was assaulted, Metz said. At some point, as officers were arriving, investigators believe Black fatally shot the intruder. Metz said that in 911 calls there was no clear description given of the attacker, and that officers were told by dispatch that a child might be being drowned. While the body camera video was not released, Metz described what is on the video and said that when officers arrived they heard Black’s wife say "he has a gun" and then heard shots from inside the home. Police later found the boy and his father in the bathroom, and a naked dead man later identified as Harper, Metz said. Toxicology tests have not yet come back, but Metz said that police were told by a family member from the house across the street from the Black home that a family member may have been on some type of drugs. An attorney representing Black's family could not immediately be reached after business hours Thursday. A number for Harper's family could not immediately be found. Metz said that police showed the body camera video and audio of a 911 call to Black's family, and that they requested the video not be publicly released at this time. He read a statement from the family in which they said that the family does not want the violent moments of Black’s death to be the legacy of his distinguished life. "The investigation is in its early stages, and until it is complete there will remain many more questions than answers," the family said in the statement read by Metz. In the statement, the family also said that harassment and threats to police over the shooting "must stop." "Any disrespect to law enforcement carried out in Mr. Black’s name would be contrary to his wishes," the family statement read. After Harper broke into the Black home, others from across the street entered in after him to try and get him out of the house, Metz said. "So imagine yourself in your own home, its 1:30 in the morning, and not only do you have one person breaking your door down, now you have multiple people coming in after him, and you don't know what’s going on," he said. The identity of the officer who shot Black was not released. Metz said that the officer is a military veteran who has been with the police department for three years, and has no prior internal affairs complaints. "He is incredibly heartbroken over this situation," Metz said. "Being a veteran himself and then finding out, as well, not only what Mr. Black had done to save his family but also being a veteran has been devastating to him,” and that the officer and his family asked Metz to convey that they are praying for the Black family. 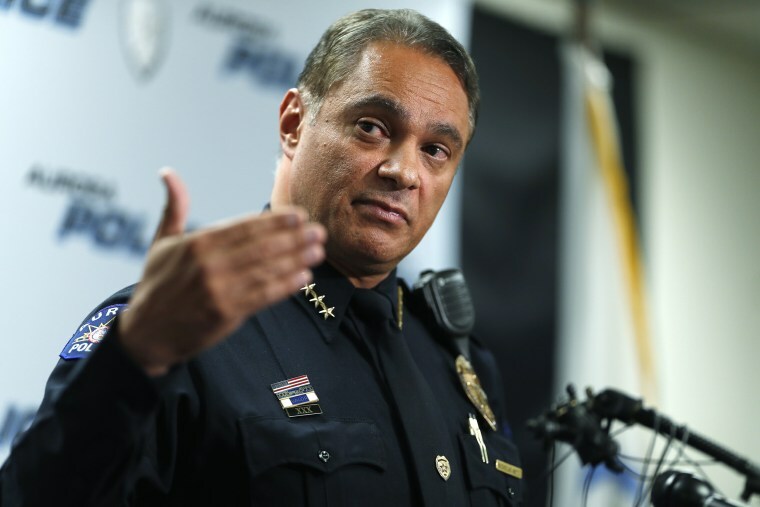 The officer who shot Black was involved in another deadly shooting on June 27, after police said officers responded to a call of shots fired and an armed suspect refused orders to drop a gun, NBC affiliate KUSA of Denver reported. Metz said Thursday that the officer received counseling and evaluations before being deemed fit to return to duty 18 days after that earlier shooting. Monday's deadly shooting of Black is under investigation and the district attorney's office is reviewing the case. The police chief denied officers acted recklessly. "I dispute that strongly," he said. "They were not reckless." "These officers responded, again, how I would expect them to respond in that kind of situation, given the limited amount of information that they were acting on, and the fact that they were responding to shots fired inside and immediately put themselves in harm's way to help save lives," he said.